It’s easy to get excited about the “next big thing” in Chrome OS. Styli, detachables and tablets. (Oh My!) These things are fabulous and we love them. But, latest and greatest do not an ecosystem make. It takes all kinds to create a truly stable environment for an operating system. From the new and shiny, to the drab and mundane and everything in between. The more Chrome OS devices are produced, the more hands get an opportunity to experience the operating system we have come to love. That is why, today, we’re excited to share another Apollo Lake-based Chromebook that has turned up in the repositories. ‘Sand’ is yet another convertible Chromebook built on the baseboard ‘Reef‘. The device, like its brethren, is fitted with the latest Atom line of Intel processors. Combined with a convertible form-factor, these types of Chromebooks continue to expand the Chrome OS line-up in the area of low to mid-range devices. Apollo Lake’s predecessor, the Braswell chip, has proven itself as a worthy vessel in devices like the Acer R11, Acer Chromebook 14 and ASUS C301SA. With the power to handle moderate computing as well as leverage the Play Store, the newest line of Atom chips are sure to be a welcome addition to this segment of Chrome OS devices. While this may seem ho-hum to many, it’s another great indicator that OEM’s are really putting stock in Chrome OS and everything it has to offer. The consumer market will always land in the middle of the road when it comes to cost vs. performance and the Apollo Lake chips should fill this post with ease. We’ll talk more later this week about what the future expansion of Chrome OS might look like and why these devices are so important. For now, if you want to take a closer look, the commit below shows some details about the new Chromebook ‘Sand’. 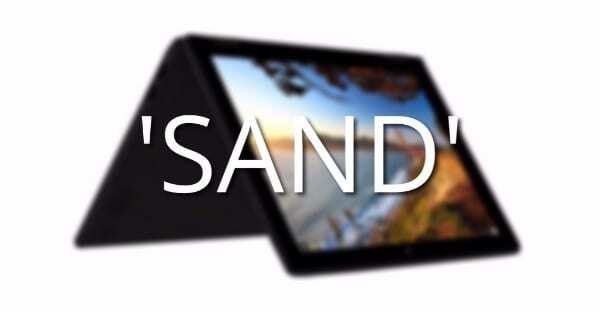 You will find all the typical sensors and nomenclature for a standard convertible Chromebook. No real clues as to who is making this new Chromebook. For all we know it may be a “white label” device created for multiple manufacturers. You can bet we will stay on top of it and let you know as soon as it is revealed. Fun Fact: All of the boards based on ‘reef’ are named after characters from the Hungry Shark franchise.